We had sushi last night. Does this qualify as upcycling? 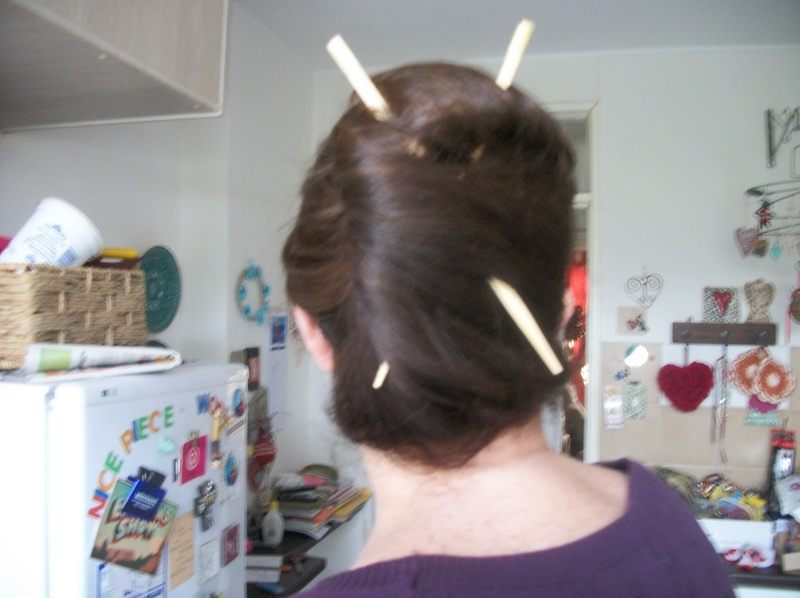 This entry was posted in inspiration and tagged chopsticks, diy, sushi on August 31, 2013 by Nice Piece of Work. They look like caterpillars. Dani’s mom had bought them for her and she didn’t know where, but I knew something would come of this idea. 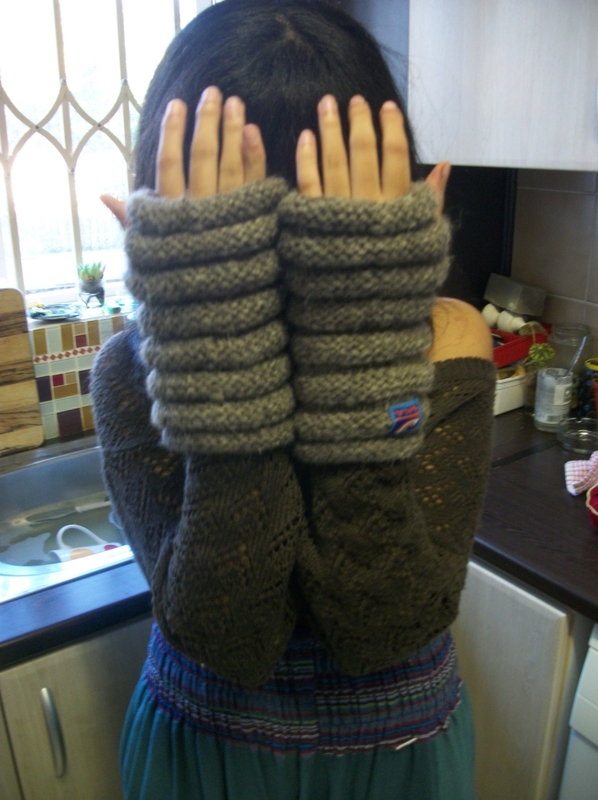 So, I unpicked a small section of the leg warmer seam, blanket-stitched around it and VOILA – wrist warmers! 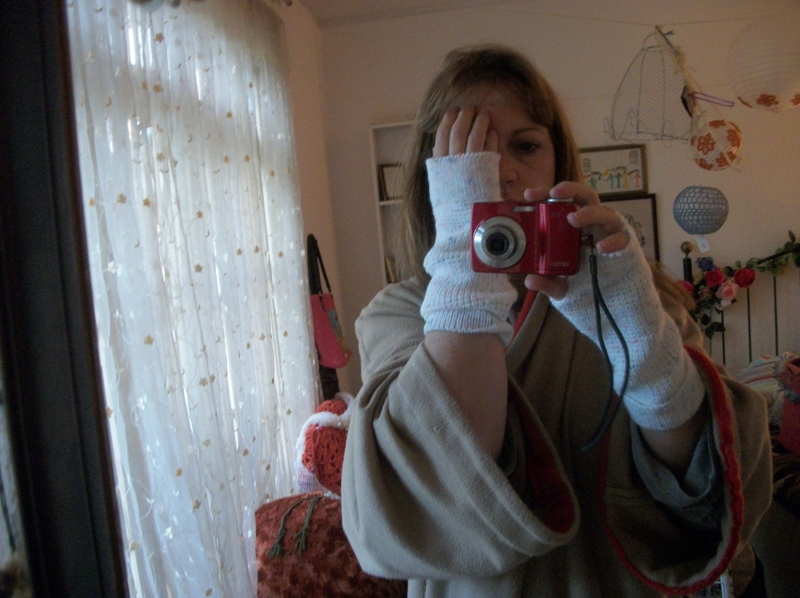 And yes, I am still in my cruddy old dressing gown and yes, I am deliberately covering my left eye (it was red and puffy when I woke up today, it’s such a glamorous look, you can imagine). I might still work a row of dc (UK dc, that is) around the top and bottom edges, but I might not. I think I like them just like this. 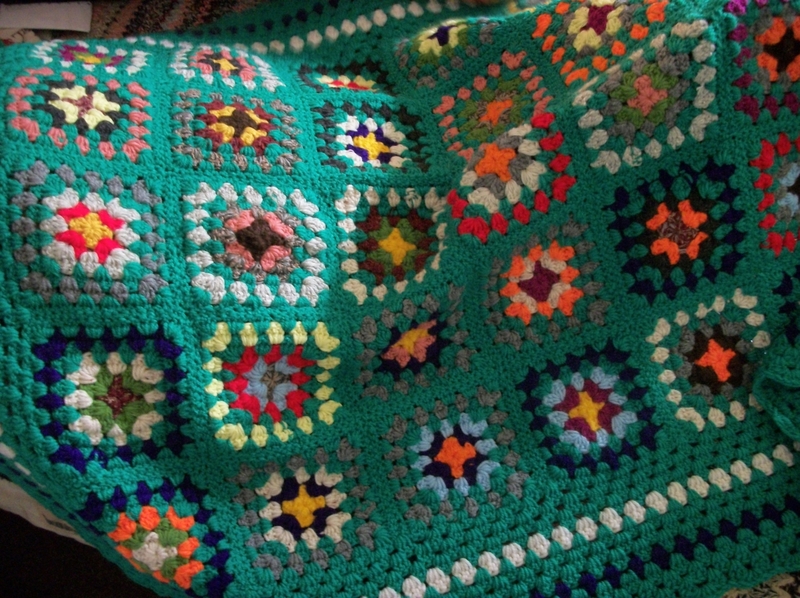 Her daughter, who I’m sure is a very nice person and wouldn’t just throw anything away thoughtlessly, has, however, lost out on this INCREDIBLY BEAUTIFUL granny square blanket. Sorry for you, Linda. It’s now on the back of my couch and it has transformed the whole room. And, of course, it makes me think of Doreen who, at 82, is one of the most inspiring and kindest and funniest and sharpest people I have ever been lucky enough to have in my life. This entry was posted in Craft, Crochet, inspiration, Knitting and tagged blanket, craft, creativity, crochet, diy, granny square, leg warmers, throw blanket, wrist warmers on May 9, 2013 by Nice Piece of Work. I have started my 2013 jar a la Rachel in her post that I reblogged yesterday, so already I feel like I have ticked something off my list of things to do. And this picture below, while not looking like much to get excited over, represents the start of my commitment to being tidier and more organised this year. I had bits of stuff and pots of cuttings all over my little garden and patio, and it was looking really messy and unloved. I dug out two pieces of wood from the garage (rescued from a neighbour’s kitchen-gutting months back) and Rob turned them into shelves for me. The large teapot is a birthday present from Anne, and now houses an ivy plant. The small one was accidentally broken and given to me to use in a mosaic. This obviously never happened, and I think it will look lovely as a planter. It had better. And, as I shouldn’t need to point out, what’s a patio without disco balls? Right, Lisa? Wishing you all good health, happiness, brilliant creative ideas, and many many reasons to get up in the mornings. This entry was posted in blogging, Craft, inspiration and tagged garden, upcycling on January 2, 2013 by Nice Piece of Work. If most of us are looking for new ways to cut monthly costs and budget more efficiently (baked beans on toast, anyone?) (cycle to work, maybe? ), no-one seems to have told the good people of Somerset West. Yesterday evening Anne and Megan treated me to a trip to the opening of the now very famous Kamersvol Geskenke at the Lourensford Wine Estate out in that verdant, rich part of the Western Cape. (Kamersvol Geskenke is Afrikaans for Rooms full of gifts). It was the most stupendous and overflowing cornucopia of gorgeous handmade art, craft, clothing, jewellery, furniture, gardens, just…EVERYTHING …that I have ever seen. The quality of the products was just incredible, and the place was PACKED to capacity. The tills and credit card machines were struggling under the pressure, and there was no sign of any let-up by closing time at 8pm. I’ve managed to restrict myself to a few photos here, to give you a rough idea. And to think I might not have gone at all if the girls hadn’t pushed me. This entry was posted in handmade, inspiration, Kamersvol Geskenke, market and tagged business, cape town, craft, creativity, design, gift, market, Somerset West on October 22, 2012 by Nice Piece of Work. …make beautiful things even if nobody cares. I love this fridge magnet – hope you can see it amongst the junk on my fridge! It was a gift from Fabulaura at the Rondebosch Craft Market last week – not sure what I did to deserve it, but I’m not complaining. 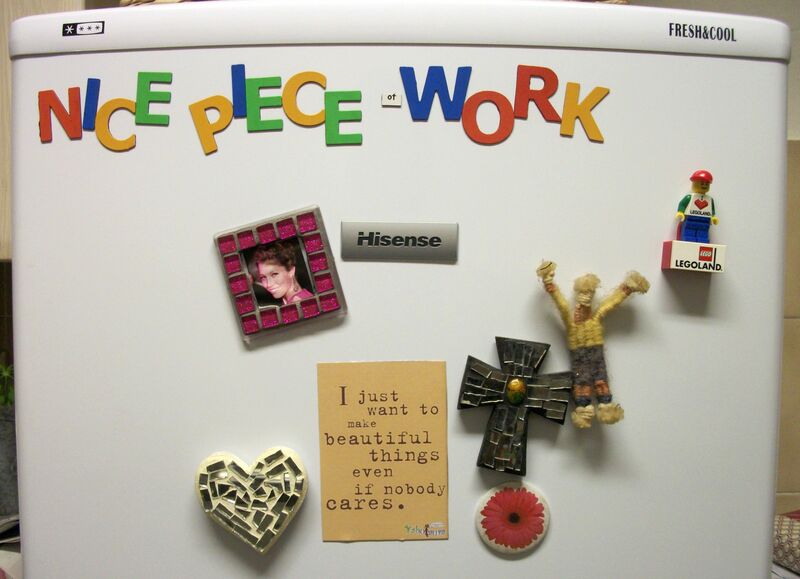 She makes a wonderful range of fabulous, funny and clever fridge magnets (and other stuff). Another one she had that sticks in my memory is “You are my favourite husband”. This entry was posted in Craft, friends, inspiration, Jam Tarts, market, Rondebosch and tagged creativity, FabuLaura, fridge magnet, gift, husband, market on October 19, 2012 by Nice Piece of Work. What can be sadder than a single broken earring? I seem to have a few lying around that I couldn’t quite bring myself to throw away. But guess what, they’ve just been given a new purpose! 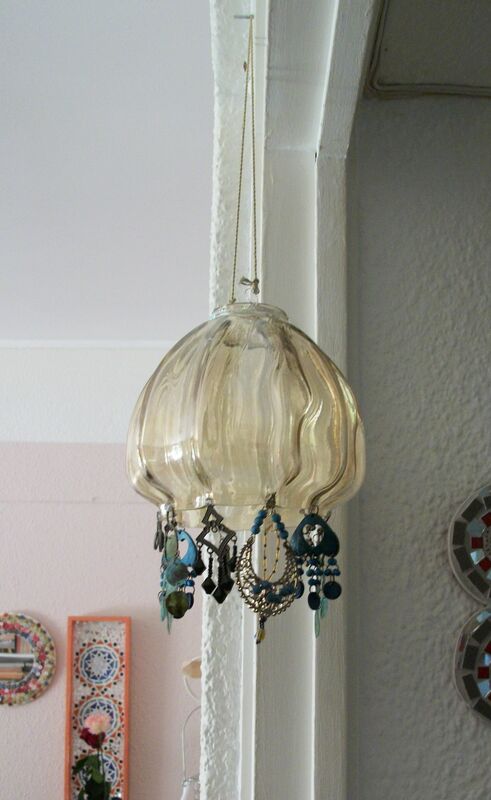 I found this glass light fitting in a junk shop in Obs the other day. At R20 I thought I’d got a bargain, but it turns out to be cracked. (Clearly it’s found the right owner.) I didn’t really know what to do with it but I cleaned it and left it prominently on the kitchen counter so that I would be ready to do something with it when inspiration struck. That just happened. 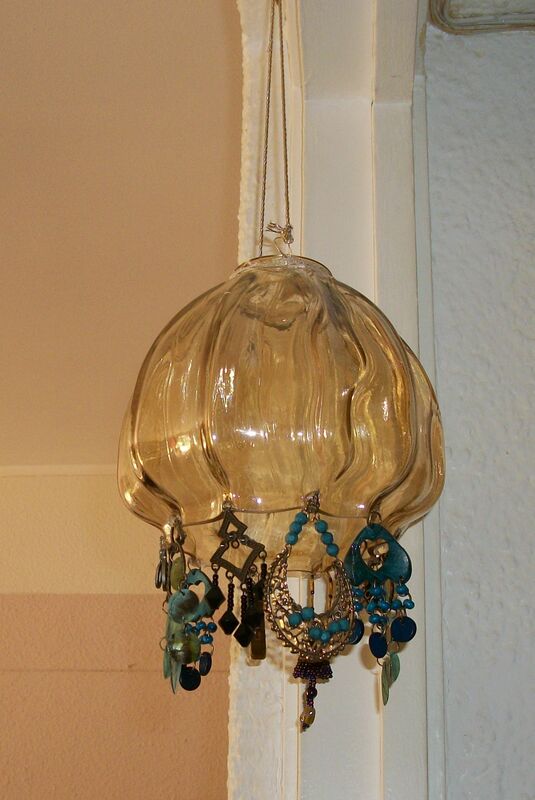 And now, it’s an earring chandelier! I put it together with the help of my glue gun, some wire and some thin gold cord, then banged a nail into the wooden door frame of my lounge to hang it on. Getting a light bulb inside it is a bit beyond me right now, but I like it purely for decoration. Plus, it’ll be just the thing that everyone cracks their head on when they come in the front door. 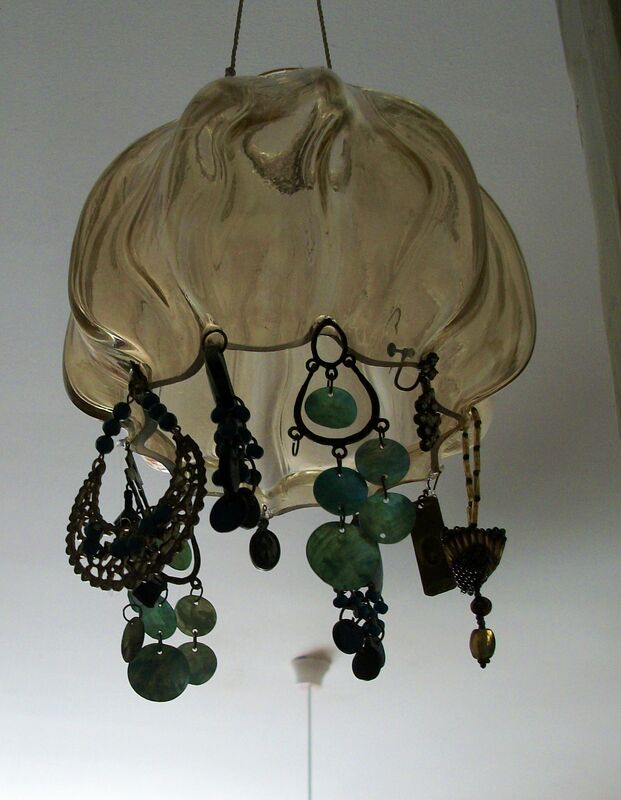 This entry was posted in inspiration, Other people's junk and tagged earrings, glass, junk shop, light fitting on October 12, 2012 by Nice Piece of Work. Sometimes I wonder if I don’t have some kind of late-onset attention deficit disorder. I seem to live my life by lurching from one thing to another (chores, projects, errands, rest periods, etc) in a haphazard and sometimes frenetically erratic series of moments. I can be halfway through writing a post when I suddenly leap up to check whether I have red 4-ply wool for a shawl I was thinking about making the other day, from a pattern I got from Janet. Wandering from the lounge to the kitchen to look for a ruler to measure a photo frame that I’m taking pics of to list on Etsy, I will start on the dirty dishes to be done, then rush back to my bedroom to check on a quote that I can’t get out of my head in a book by Rachel Cusk because I think I left it next to my bed, and en route find myself glueing bits of mirror onto a Number One for a new mosaic order. This entry was posted in inspiration and tagged mosaic, occupational therapy on October 4, 2012 by Nice Piece of Work.